Receiving big cheers from the crowd, head coach Warren Gatland said how he has "really loved his time here." He added that when he joined the team: "There was no way to go but up." "I have loved every minute here, you people have been so friendly, welcoming. Thank you very much. "This group of players is very special. What we have achieved over the last 12 years… makes it very special." Someone from the crowd shouted to Gatland: "Don't go to England!" He replied: "I would never be allowed back across the Severn Bridge!" Speaking at the end of the event, First Minister Mark Drakeford told the team: "We are enormously grateful." He added: "It was suggested in the newspapers over the weekend that the captain ought to be the next First Minister of Wales. "When his time comes, I will be there to support him!" Image caption First Minister Mark Drakeford said "We are enormously grateful"
"He entered the room with a Grand Slam and will leave the room with a Grand Slam," he said. "He brings out the best in us." Deputy Presiding Officer, Ann Jones AM, said: "What a championship, what a squad. What amazing fans and finally, of course, what a Grand Slam." The team kicked off a weekend of revelry with an emphatic 25-7 victory over Ireland at the Principality Stadium - their record 14th win in a row. Team mascots Joey Hobbs was given the gift of Alun Wyn Jones' jacket as he shivered in the cold conditions in the stadium. Joey's father, Dan Hobbs, told BBC Radio Wales: "It was absolutely baltic and he was shivering...Alun Wyn looked after him well." Mr Hobbs explained: "He ran straight over, still with Alun Wyn's top on, and that was his main concern - he was just saying 'What shall I do with this Dad, do I need to give it back?'" He added: "He just saw a little kid who was cold and he looked after him, I don't think Alun Wyn would think any more of it than that he just did what was right for him to do." One onlooker said: "He went on about midnight and played a great set. All killer no filler." The Prince of Wales has sent a message of congratulations to the team, from his tour of the Caribbean, for their "brilliant performance". 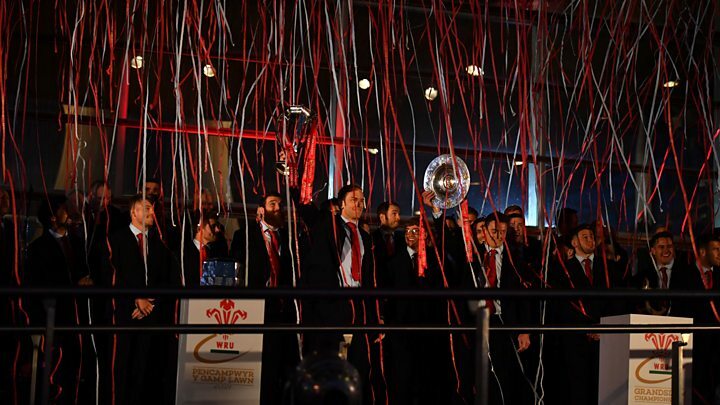 He said: "Please pass on my warmest wishes to all involved in this tremendous achievement, which made me extremely proud of Wales.